His Highness the Aga Khan is greeted by Justin Trudeau as he arrives in Ottawa, Canada, to celebrate his Golden Jubilee in 2008. At that time, Mr. Trudeau was a Member of Parliament in his riding in the Province of Quebec. He won the Liberal leadership in 2011, and after winning the recent Federal Elections held in October, he was sworn in as the Prime Minister of Canada on November 4th 2015. A day earlier he visited the Delegation of the Ismaili Imamat Building on Sussex Drive in Ottawa – see photo below. Photo: The Ismaili. “Today, we celebrate the birthday of His Highness the Aga Khan, the spiritual leader of the Shia Ismaili Muslims, who has dedicated his life to the promotion of peace, pluralism, and compassion around the world. “For over fifty years, the Aga Khan has been an inspiration to millions, working tirelessly to improve the health and education of those living in some of the world’s most vulnerable countries. As a global humanitarian leader, he has worked with many partners – including Canada – to implement vital programs that advance long-term solutions to poverty, illiteracy, and disease. Prime Minister Justin Trudeau with Aga Khan Development Netork (AKDN) Representative Dr. Mahmoud Eboo (left) and the President of the Aga Khan Ismaili Council for Canada, Malik Talib, at the Delegation of the Ismaili Imamat in Ottawa on November 3, 2015, a day before he was sworn in as Prime Minister. Photo: The Ismaili. “I have seen first-hand the Aga Khan’s commitment to the ideals of diversity and inclusion. As a nation, we are proud His Highness was granted honourary Canadian citizenship for the leadership he has shown to advance development, pluralism, and tolerance – values that are at the core of our national identity. “Happy Birthday to the Hazar Imam” – Yasmin Rattansi, MP Don Valley E.
His Highness the Aga Khan, MP Yasmin Ratansi and External Affairs Minister Pierre Pettigrew (July 2004 – February 2006). Photo: Jean-Marc Carisse. Copyright. “Mr. Speaker, I take this opportunity to thank the constituents of Don Valley East for re- electing me to Parliament. “My riding is proud to house three architectural jewels of Toronto: the Aga Khan Museum, the lsmaili Centre, and the Aga Khan Park built in Canada by His Highness the Aga Khan with his own funds. “On December 13, His Highness will be celebrating his 79th birthday. I rise today in the House to pay a special tribute to a remarkable human being. His tireless efforts in building bridges across the globe, his commitment to eradicating poverty and ignorance for millions of people, irrespective of race or religion, through the AKDN network are unparalleled. “I was fortunate to have worked with His Highness in establishing the Global Centre for Pluralism here in Ottawa. A Message and Tweets from the Premier of Ontario, Kathleen Wynne, and Arif Virani, MP Parkdale–High Park. Mawlana Hazar Imam graciously accepts the standing ovation he receives after completing his speech at the opening of the Aga Khan Park in Toronto on May 25, 2015. With him is the Premier of Ontario, Kathleen Wynne. Photo: Simerg/Malik Merchant. Copyright. Warm wishes to Ontario’s Ismaili community on the occasion of His Highness the Aga Khan’s 79th birthday today! Date posted: December 13, 2015. PLEASE CLICK: Ameer Kassam Janmohamed (1931-2014) or photo for tribute. Date posted: December 31, 2014. “….when it comes to being the first Pakistani woman and the first Ismaili woman to put the nation’s flag and the Ismaili Imamat red and green flag on top of the world, one cannot adequately express the feeling. It is indeed a BLESSING of a life time! We did bring the flag back, and with all love and respect, sent it to Sarcar Mawlana Hazar Imam.” — Samina Baig in exclusive interview with Simerg, see link below. 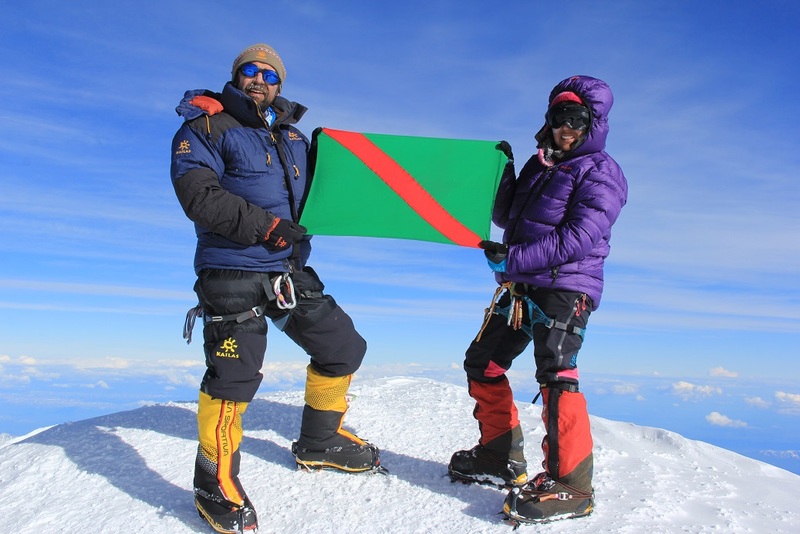 Mirza Ali and his sister Samina Baig hoist the Ismaili Imamat Flag after reaching the summit of North America’s highest mountain, Mt. McKinley, in Alaska, on June 28, 2014. Their goal is to reach all the “Seven Summits”, and with this latest conquest only one remains to be peaked. Photo: Mirza Ali/Samina Baig. Copyright. In a recent exclusive Interview with Simerg, Samina Baig and her brother Mirza Ali Baig spoke about the challenges of mountaineering and their goal to scale the “Seven Summits”, that is to reach the top of the highest mountain in each continent over a period of several months. At the time of the interview, five of the seven mountains including Mt. Everest, the world’s highest, had been conquered since they began their quest in April 2013. Two remained to be climbed. On June 28, 2014, at 7:20 pm, the brother and sister team made it to North America’s highest summit, Mt. 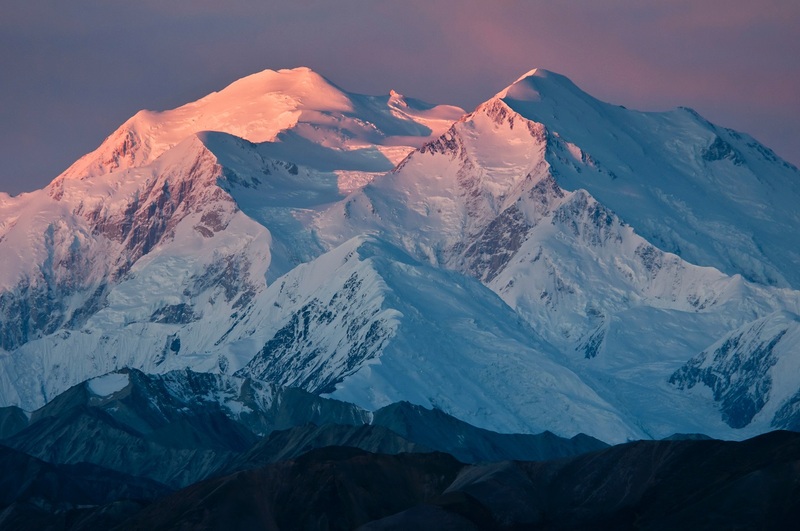 McKinley (20,322ft/6,194m), also known by the native name Denali in the Koyukon and Athabaskan languages, meaning the “High One”. The weather condition was unpredictable and, incredibly, the gain from the base camp to the summit was higher than Mt. Everest! The duration of the expedition was three weeks. Mirza Ali stated that it could have been done in 18 days, but they got struck at Camp IV at 17,200 ft for four days due to severe weather. It took them 15 hours for the return climb. As with Mt. Everest and other mountains, Samina and Mirza hoisted the Ismaili Imamat Flag on the peak of Mt. McKinley. While there are differing explanations on how the Caucasus Mountain Range is distributed between Europe and Asia, it is generally accepted that Mount Elbrus (18,510ft) is in Europe and is therefore the highest mountain in all of Europe. Samina and Mirza Ali Baig are now on their way to Russia for the climb. Photo: Wikipedia. Simerg congratulates Samina and Mirza on their monumental feat and continuing success, and wishes them the very best as they depart the USA to conquer the last of the seven summits, Mount Elbrus (18,510ft/5,642m) in Russia, which is considered to be the highest mountain in Europe. They expect to reach their goal of “Seven Summits” by the end of this month or early next month, Inshallah. Date posted: Saturday, July 19, 2014. Date updated: Sunday, July 20, 2014 (Mt. Elbrus photo). Samina Baig’s cultural elegance captured in this exquisite cultural dress from Hunza. Photo: Samina Baig’s Facebook page. Please Continue Reading This World Exclusive Interview for the broader perspectives it offers about the challenges of climbing some of the world’s highest mountains! Share and forward this LINK to your friends and family around the world. Please also leave your comments on the article’s feedback form. Photo: Collection of the family of the late Mrs. Jean Kirk, Headmistress, Aga Khan Primary School, Nairobi. Copyright: Allison Wallace, Australia. Samina Baig climbing Mt. Everest. Photo: Mirza Ali. Copyright. Click on image to read interview.